African Elephants are found in parts of central, eastern and South Africa in grasslands and open woodlands. Asian elephants are found in parts of India and Southeast Asia in scrub forests and rain forests. Male African Elephants can reach 13 feet tall weighing up to 13,000 pounds (size of a school bus). Male Asian Elephants may weigh as much as 11,000 pounds while females of both species are smaller, in both weight and height. 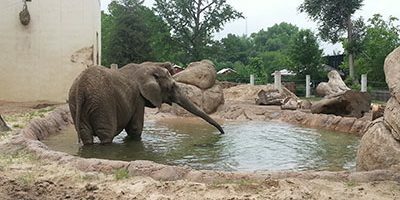 Both African and Asian Elephants are herbivores meaning they eat plants and tree materials. Their diet in the wild includes grasses, leaves, roots, tree bark, fruits and other vegetation. Digesting only about 40% of what they eat; they consume a tremendous amount of vegetation. They drink about 30 to 50 gallons of water a day. Both African and Asian Elephants are listed on the Red List of threatened species (IUCN). African elephants are considered vulnerable, and the Asian elephant is considered endangered.